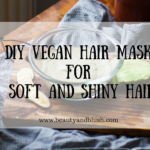 I have been trying out a lot of Diy hair rinses and diy hair shampoos these days and I am more than happy as they are so mild on the scalp and yet so effective. 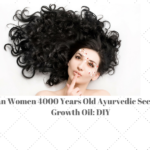 My quest for learning new diy’s and different methods for washing my hair with natural ingredients is increasing and in that search I stumbled upon a post where I read that women of a remote region in China owe their famously long hair to a very natural and very cheap natural method. 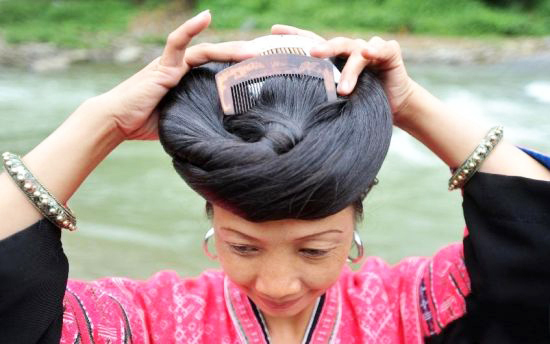 For the Yao minority of women, their hair is the most prized possession. 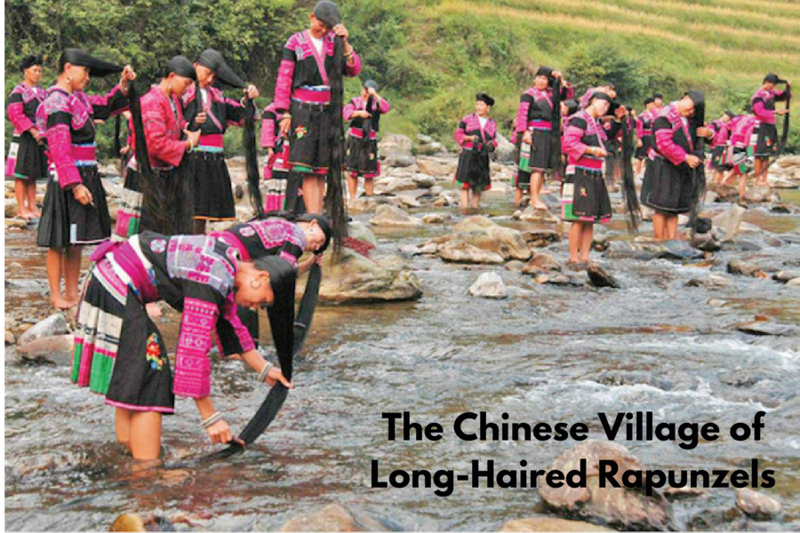 The ancient settlement is known across China as the “Long Hair Village” and is even recognized by the Guinness Book of World Records as the “World’s Longest Hair Village”. 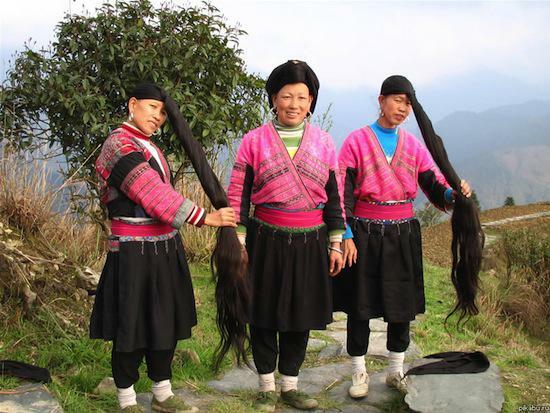 The average length of the women in Huangluo is 1.7 meters and the longest hair length exceeds to 2.1 meters long and they manage to keep it looking strong and healthy and free of grey hair well into their old age. 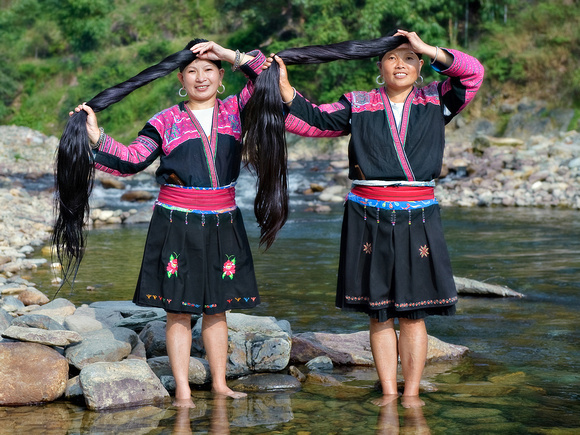 The different hairstyles of the Yao women depict different stages of her life and it is really interesting to read their customs and how hair plays such an important part of their lives. For example, if the hair is wrapped like a circular tray on the top of the head means she is married but has no children. If she sports a bun at the front of her wrapped style-it means she is married and has children. If she wears a scarf around her head, with her hair hidden, it means she is looking for a husband, who traditionally will be the only man who will have the privilege to see her hair in all it’s beauty. So enough about the customs of the Huangluo village, now lets get into the real secret for such long and beautiful hair. Do you guys want to know their secret to Rapunzel like hair, then keep on reading this post. FERMENTED RICE WATER, yes, generations of Yao women have been using fermented rice water to wash their hair, which has resulted in their impressively long and beautiful hair. It’s been their secret to long hair for centuries. 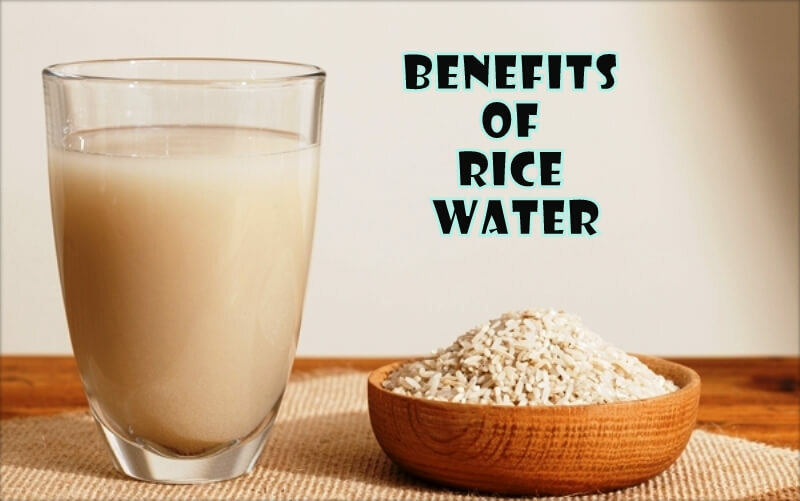 According to various studies, the fermented rice water found to be rich in antioxidants, minerals and Vitamin E as well as restorative properties and improve hair’s elasticity and condition. Inositol, a carbohydrate that is found in rice water has the ability to repair damaged hair as well as protect it from future damage. 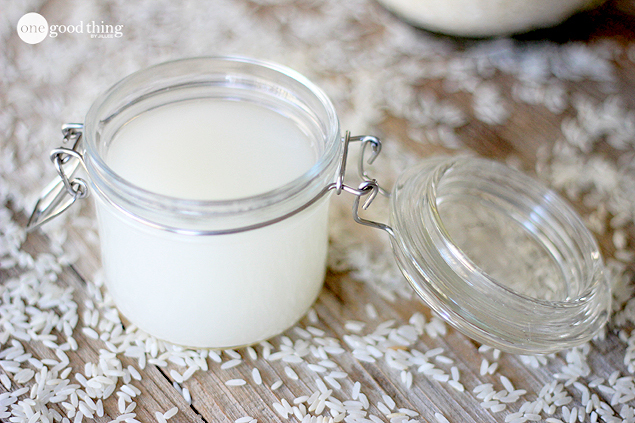 In addition to this, amino acids in the fermented rice water helps to strengthen the hair roots and surface of the hair making it much more shinier. 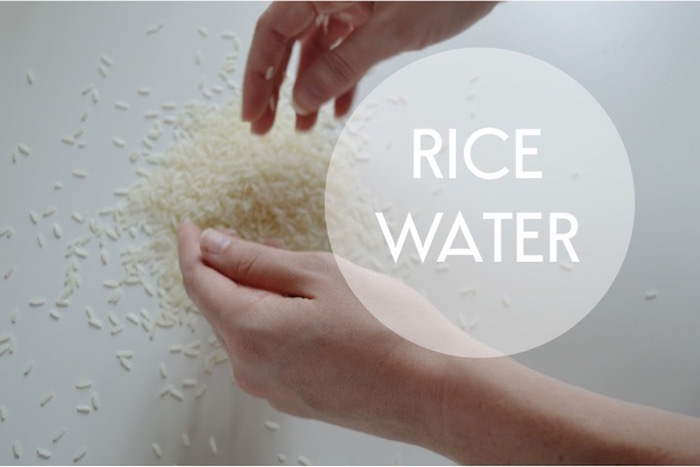 For example if you cook rice two to three times a week, you should be able to connect enough liquid for two to three hair washes . Rice Shampoo works in a different way than commercial shampoos so don’t expect a foam while massaging your scalp with it. 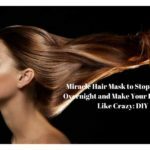 Do not expect a miracle after the first application- it is possible that you won’t like the effect after the first application- this is just because your hair need some time to get used to such natural products. So you need to be a little patient while trying out natural and chemical free products. Wow they really do have some long hair! It was interesting to read about their customs. I can see why it would be important for them to take extra care with their hair. Yeah Lisa,it is really interesting to read how important their hair are for them. I haven’t tried it but I would like to try! Tempted looking at the gorgeous mane of Chinese ladies! Do give it a try Shatchya.If washing hair with fermented rice water gives hair like that I will keep on using it. Hi Kim.You have to wash raw rice and and take out the water in which the rice had been soaking for 30 minutes and then ferment that water. Wowww now this is something!!! Really Amrutaa.Never thought something as simple as rice water would do wonders to the hair. Yeah Richa this world os really made up of some strange facts.The fermented smell is not that overpowering because you have to mix in equal quantity of water in it.You can definitely add in a few drops of lavender or rosemary essential oil.Do try it out.I have uploaded some diy oils on my blog recently which are so damn effective,if you are going through a hair fall phase try them out and I am sure you will see some improvements dear. Really Anumeha it is really tempting to see such long and thick hair with such a cheap and effective ingredient. 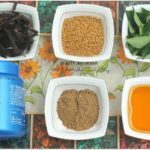 Anamika you should surely try this out.I have been using it for a month and I am pretty happy with the results.Do let me know your experiences.? I have been using it for 2 months now and I must say it really helps if you want to grow your hair. Do give it a try Sonali. Thanks a lot Soumya.Your sweet comments make my day dear.Do use the fermentated rice water,maybe your hair also grows as long as the hair of these chinese woman. 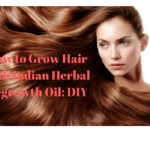 I have been using it for a couple of months now and I can feel that my hair is growing at a fast pace and it has also become thick with usage. Try it out and share your experiences. Wish you a speedy recovery dear. Hi.. I do not boil the fermented rice water.. I just keep it in the refrigerator to stop the fermentation process..I think you also should not boil it. Boiling the rice eater may ruin or change the chemical composition of the rinse. I will try this. Have been using an Indian recipe made of hibiscus flowers and leaves which is excellent and costs nothing as the bushes grow everywhere around here. I was losing too much hair when combed or brushed until I found biotin (Vitamin H) which had quick results and now only a few hairs on my comb. Oiling the scalp and massage daily is important. I use a light oil like apricot oil as my hair is very fine. Hair length is also genetically determined – mine will not grow beyond waist length. I once saw a photo of Chinese coolies during the Australian gold rush days in the 19th century. Although most of their head was shaved as was the custom, their pigtails reached to their heels. I have seen a local girl with amazing red hair down to her ankles where it is cut to keep it off the floor! – Gayle, Perth Western Australia. Gayle i haven’t tried apricot oil for head massage but will definitely try it out. I have heard that mixing biotin tablets in hair oils also accelerates hair growth, never tried it out but will definitely give it a try. 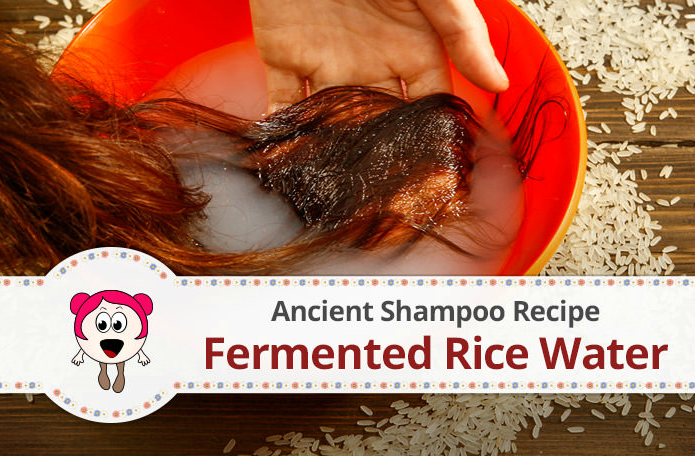 Try out the fermented rice water for rinsing the hair, it does help to outgrow the hair. Hello. Do try it out, it surely works. I have tried it out myself and it gives amazing results. Great, rinsing hair with rice water works wonders for the hair. Hi Mani, I am glad you liked the blog post. Hi, Yamni. Thanks for sharing the valuable info. I have two questions about it. 1. I am a 48 year old male and found out that I have lost lots of hair recently. Does this method work for the middle age man for hair re-growth? 2. There are several types of rices and they have different nutrition. The component of the white rice is carbohydrate and the component of the brown rice is fiber. Therefore, the result must be different. What kind of rice did you(and the Chinese ladies) use? Andy ancient chinese women use white rice so it will be better if you use white rice. I am sorry, but have come back as I forgot to ask you more questions. 3. I tried the onion juice for hair re-growth, but it didn’t work so much. Is this method more efficient than the onion juice? 4. How long does it take to get a result? Andy onion juice is great for the hair but if that didn’t work for you, you can try this out as well. You will be able to see the results within 2 weeks, I guess, it may differ from person to person. Hi there! Loving this post thanks so much for posting! I’m just curious what type of ride you use I know you said raw rice but what kind of raw rice? Tyia! Ashley you can use any variety of raw white rice, nothing in particular. Hello. I was wondering if I could just spray it on my hair and leave it there then apply my leave in conditioner on top. Do I really need it to wash it out ? Hi, never used it in this way, you can definitely try it out. Does it help? I have very thin and short hair, tried lots of natural remedies. No growth lowers my self esteem also lowers my motivation to try something new and getting no good results. Do try this out. It really helps. I’m african american and learned about this method about eight months ago…Last year I turned 40 and suffered major hair loss for a 2nd time after semi growing my hair back from the 1st hair lost…I was doing research on youtube and this is by far the best and effective method to regrow and thicken your hair! Every week I 1st wash my hair with shampoo, rinse and then pour my fermented rice water onto my hair…I then sit under a hair dryer for 15 min and allow it to completely dry and drys like a protein treatment (hard)…I then rinse it without using any conditioner…I put home made okra gel into my hair and style as usual…I wish I had pictures to show my growth and its thickness! Its amazing! My hair appears black(NO LIE) and the thining on my crown, edges and top of my hair is RAPIDLY growing back! Its truly a blessing from GOD! 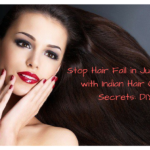 It is great to hear that your hair loss has stopped completely with this ancient secret remedy. I have never tried okra gel on my hair, will definitely try it out. 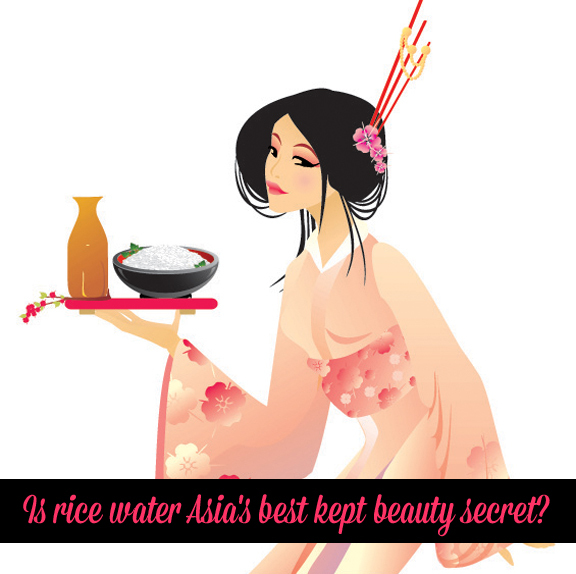 After you have made the rice water and it has fermented, is the rice safe to eat? I think that I missed that part. Yes, the rice is safe to eat. I have blond hair . I color it to lighten. With natural coloring. Will the rice water darken it. No, rice water won’t darken it.